After refilling the cartridges an inkjet printer, often found the problem with their subsequent use – the ink begins to flow, leaving ugly spots, stains and streaks on the paper. To avoid such troubles, it's better to trust refilled ink cartridges to specialists of the service centers or just follow the instructions of the user. Remove the print cartridge from the printer and, if necessary, remove remaining ink with the printing device. Note the sticker that sealed the place of the cartridge filling with ink - it should fit snugly to the surface. If the cartridges were made repeatedly, replace the sticker. Also, the same problem may occur when you use tape. It is best to use specifically for this film or stickers that adhere well to the plastic surface.Another likely cause of leakage of the ink from the ink – exceeding their optimal quantities when refilling. It is always better to nedzarici the paint in the cartridge to avoid such troubles, especially if he is starting. Usually, their volume is a little smaller than those sold separately.Also please note that when filling the cartridge, the syringe needle was not fully inserted, enough for 1/3 of it. After refilling leave the cartridge for 10-12 hours for a more uniform distribution of ink – they cluster in one part may cause leakage and stains during printing.Check the body of the cartridge for damage – it may well be that there are small cracks through which the ink flow out. 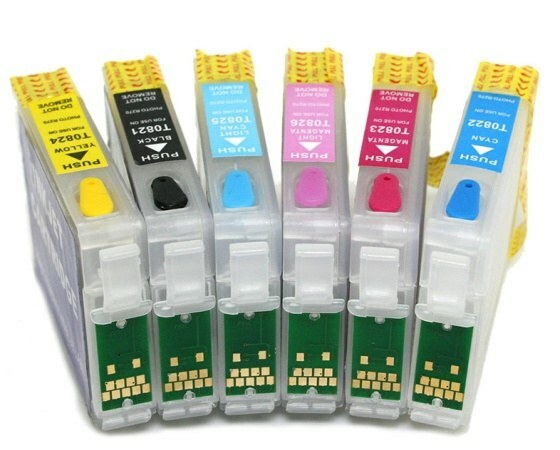 Also, the problem may be that repeated use of the same cartridge, it is best to change them after 5-6 reloads, but if you do photo printing, then after 3-4.Also note the special device a continuous supply of ink in printers - they usually have a lot less problems, and the procedure of refilling is much easier. This is especially useful if you frequently print photos and color images, and also if you need excellent print quality data in large volumes.